Electromagnetic shielding stategies are increasingly incorporated in the construction of new buildings, and are easily retrofitted in existing constructions to reduce radiation intensity in living or working spaces. 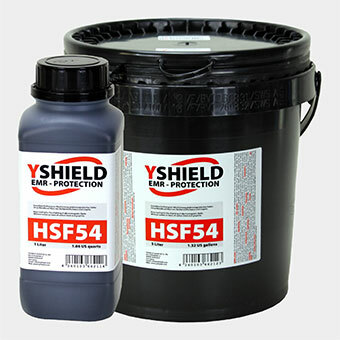 An effective and easily implemented solution for both interior and exterior shielding is to apply specially designed electrically-conductive paint to walls and ceilings. Conductive paint is available in several formulations, and is composed of carbon particles suspended in a high-quality acrylic binder - the paints contain no metallic components and thus are highly resistant to corrosion. The paint is applied with a roller (can also be sprayed) just like a standard decorative emulsion wallpaint. The conductive paint layer, which is black in colour, can subsequently be painted over with a layer or two of decorative wall or façade paint. The paint is water-resistant, and exhibits high adhesion on many standard construction and decoration materials, such as cement, plaster, masonry, emusion wall paint, etc. The paints do not contain toxic solvents, plasticizers, or any other toxic ingredients. Please contact us for further information, prices, and orders. Shielding meshes and guazes are versatile and can be incorporated into building materials during construction or renovation work, or incorporated into virtually any exisiting structure. 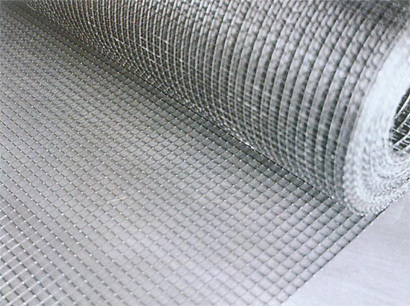 We supply a wide range of meshing for all possible shielding projects, and provide technical guidance as to the most suitable material and installation procedure for your project. Heavy-duty meshes are used for exterior applications, are foldable, and resistant to frost and rot. They can be installed in walls or concrete structures, underneath roofing tiles etc. Lighter meshes can be stapled or tacked onto plaster board, wooden frames or glued onto smooth concrete or other substrates. Still lighter material can be used as a flyscreen for example. Shielding meshes are generally supplied on rolls of width 1 meter. For high-efficiency interior shielding, for example where sensitive scientific or mediccal equipment needs to be isolated from high-frecuency electromagnetic signal, or in the construction of Farady cages, metallized nylon fleeces or metallized polymer nettings with high shielding effectivness, up to 100dB at 1 GHz, are generally used. The materials suitable for a wide range of applications where a high degree of radiation attenuation is required, and can be loose-laid or can be glued or stapled onto drywall/plasterboard for example. 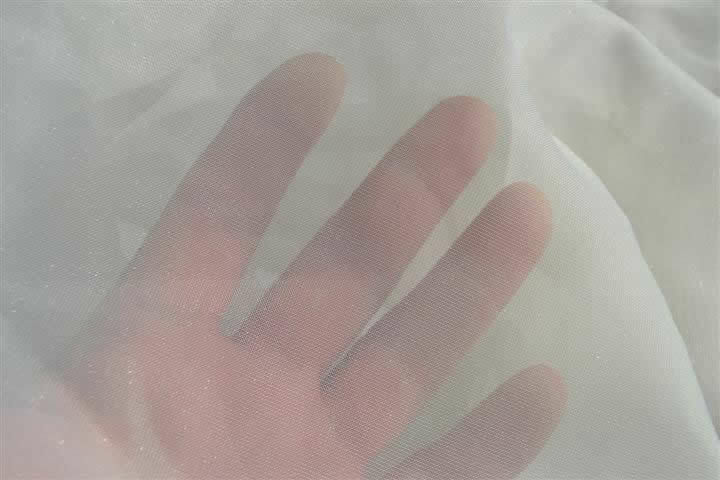 Often the simplest method to drastically reduce the intensity of elecromagnetic radiation entering a building through the windows, open or shut, is to install net curtains made of specially produced shielding fabric. 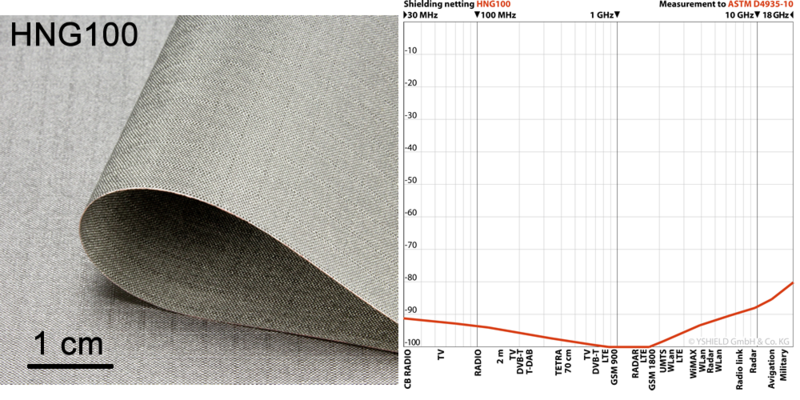 Shielded fabrics are made from polyester or cotton filaments woven with micro-fine silver/copper threads; the metallic threads are coated in a lacquer, thus the material has no surface conductivity. The fabrics have the look and feel of a standard net curtain material, and is worked in the same way to produce curtains, and also "mosquito nets" to protect beds against electromagnetic radiation. The materials are washable and supplied by the running metre (rolls widths 2,5 m - 2.95 m depending on the material). Products available include the Swiss-Shield fabrics New Daylite, Naturell and Voile. Windows can also be shielded using transparent, conductive self-adhesive films. The films are available in various grades, optimized for light transmission or shielding efficiency according to the customer's requirements. 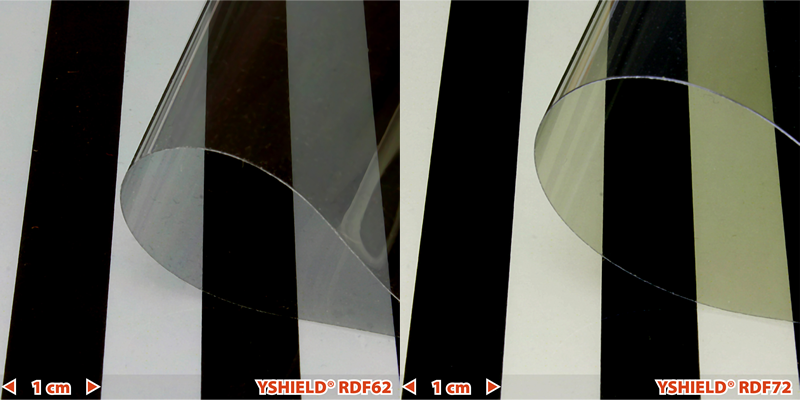 Shielding films are best suited to aluminium window frames, and should not be used on heat reflective glass panes. We recomend that wall shielding systems are connected to an electrical earth for personal safety and to prevent the generation of low frequency electromagnetic fields through field coupling with the building's electrical wiring system. Please note that shielding does not require an electrical earth to function as a shield against high-frequency electromagnetic radiation. Earth connections to walls treated with shielding paint are easily made using a ground connection kit, generally consisting of a steel plate which screws into the shielding wall with a conductive fleece on the rear side to ensure a good connection to the paint or mesh surface. We supply all materiales necesary to connect your shielding system to an electrical earth.